Lindsay's work focuses on quantitative methods and their application to questions regarding the effectiveness of educational policies and programs across the pre-school to postsecondary spectrum. Much of her recent work has focused on implementing large-scale randomized trials to investigate potential solutions to "summer melt," the phenomenon that college-intending students fail to transition successfully from high school to college. Lindsay has co-authored a book on summer melt to be published by the Harvard Education Press this coming fall. 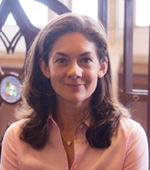 Lindsay earned an EdD in quantitative policy analysis in education as well as a master's degree in statistics and a master's degree in administration, planning, and social policy, all from Harvard. She holds a bachelor's degree from Dartmouth College. Morris, P., Connors, M., Friedman-Krauss, A., McCoy, D., Weiland, C., Feller, A., Page, L., Bloom, H., & Yoshikawa, H. (2018). New findings on impact variation from the Head Start Impact Study: Informing the scale-up of early childhood programs. AERA Open, 4(2), 1–16. Smythe-Leistico, K., & Page, L. C. (2018). Connect-Text: Leveraging text-message communication to mitigate chronic absenteeism and improve parental engagement in the earliest years of schooling. Journal of Education for Students Placed at Risk. Ertefaie, A., Hsu, J. Y., Page, L. C. & Small, D. (2018). Discovering treatment effect heterogeneity through post-treatment variables with applications to the effect of class size on math scores. Journal of the Royal Statistical Society, Applied Statistics (Series C), 67(4), 917-938. Miratrix, L., Furey, J., Grindal, T., Feller, A. & Page, L. C. (2018). Bounding, an accessible method for estimating principal causal effects, examined and explained. Journal of Research on Educational Effectiveness, 11(1), 133-162. Dougherty, S. M., Goodman, J., Hill, D. V., Litke, E. G., & Page, L. C. (2017). Does more rigorous middle school math coursework change students’ college readiness? Brookings Brown Center Chalkboard. Dougherty, S. M., Goodman, J., Hill, D. V., Litke, E. G., & Page, L. C. (2017). Objective course placement and college readiness: Evidence from targeted middle school math acceleration. Economics of Education Review, 58, 141-161. Page, L. C., Lowry, D. J. & Nurshatayeva, A. (2017). An examination of the relationship between school district FAFSA completion rates and district poverty levels. Washington, DC: National College Access Network. Castleman, B. L., & Page, L. C. (2017). Parental influences on postsecondary decision making: Evidence from a text messaging experiment. Educational Evaluation and Policy Analysis. Papay, J. P., Bacher-Hicks, A., Page, L. C., & Marinell, W. H. (2017). The challenge of teacher retention in urban schools: Evidence of variation from a cross-site analysis. Educational Researcher, 46(8), 434-448. Papay, J. P., Bacher-Hicks, A., Page, L. C., & Marinell, W. H. (2017). The challenge of teacher retention in urban schools: Evidence of variation from a cross-site analysis. Educational Researcher. First published online. Feller, A., Grindal, T., Miratrix, L. & Page, L. C. (2016). Compared to what? Variation in the impacts of head start by alternative child care setting. Annals of Applied Statistics, 10(3), 1245-1285. Page, L. C., Kehoe, S., Castleman, B., & Sahadewo, G. A. (2016). More than dollars for scholars: The impact of the Dell Scholars program on college access, persistence and degree attainment. Retrieved from SSRN: http://ssrn.com/abstract=2726320. Castleman, B. L. & Page, L. C. (2016). Freshman year financial aid nudges: An experiment to increase financial aid renewal and sophomore year persistence. Journal of Human Resources, 51(2), 389-415. Page, L. C. & Scott-Clayton, J. (2016). Improving college access in the United States: Barriers and policy responses. Economics of Education Review, 51, 4-22. Hurwitz, M., Mbekeani, P. P., Nipson, M. M., & Page, L. C. (2016). Surprising ripple effects: How changing the SAT score-sending policy for low-income students impacts college access and success. Educational Evaluation and Policy Analysis. Anthony, A. M., Page, L. C., Seldin, A. (2016). In the right ballpark? Assessing the accuracy of net price calculators. Journal of Student Financial Aid, 46(2). Castleman, B., & Page, L. (2015). Beyond FAFSA completion. Change: The Magazine of Higher Learning, 47(1), 28-35. Dougherty, S., Goodman, J., Hill, D., Litke, E., & Page, L. C. (2015). Early math coursework and college readiness: Evidence from targeted middle school math acceleration. National Bureau of Economic Research, 1-50. Page, L. C., Feller, A., Grindal, T., Miratrix, L., & Somers, M-A. (2015). Principal stratification: A tool for understanding variation in program effects across endogenous subgroups. American Journal of Evaluation, 1-18. Castleman, B. L., & Page, L. C. (2015). Summer nudging: Can personalized text messages and peer mentor outreach increase college going among low-income high school graduates? Journal of Economic Behavior & Organization, 115, 144-160. Arnold, K. D., Chewning, A., Castleman, B., & Page, L. (2015). Advisor and student experiences of summer support for college-intending, low-income high school graduates. Journal of College Access, 1(1). LRDC's Lindsay Page and Pitt's School of Education Tanner Wallace are two of 12 new researchers to join the Mindset Scholars Network. The network is a community of researchers dedicated to advancing our understanding of students’ psychological experience of learning and school from an interdisciplinary perspective. Lindsay Page was quoted in the October 2 New York Times, "The Power of Student Peer Leaders." Lindsay Page and her research on summer melt were featured in The Journal Times in an article titled, "Texting Program Aims to Help Unified Students get to College". Lindsay Page and her colleague published a blog post on The Brookings Institution on September 11 about their work on summer melt. The post is titled "Freezing 'Summer Melt' in it's Tracks: Increasing College Enrollment with AI." Lindsay Page's research on summer melt was featured in a Washington Post article titled "Students Are Dropping Out of College Before Even Starting. Here’s How Educators Are Trying to Stop the Trend" on August 23. Lindsay Page and her research on summer melt were cited in a Chronicle of Higher Education newsletter on August 9th, 2018. Lindsay Page had her research on summer melt featured in an infographic in The New York Times on August 5th, 2018. Lindsay Page recently participated in a podcast interview for CPRE Knowledge Hub about her study titled "The Promise of Place-Based Investment in College Access and Success: Investigating the Impact of the Pittsburgh Promise." Lindsay Page has her research on summer melt and it's effects on low socioeconomic students covered in a Vox piece published on August 3, 2018. Lindsay Page was featured in The Conversation on May 26, 2018 for her article "Is a Tuition-free Policy Enough to Ensure College Success?" that supports the Dell Scholars program. Lindsay Page has been appointed as one of 45 Faculty Research Fellows to the National Bureau of Economic Research (NBER) in the program on the economics of education. NPR quoted Lindsay Page on an NPR Ed All Things Considered piece, titled "College Decision Day Brings Relief, Excitement and Big Worries About Money," on May 1, 2018. Lindsay Page is the recipient of the 2018 AERA Division L Early Career Award. She has been selected as a result of her work on a wide range of higher education topics, including summer melt. Lindsay Page's research on summer melt is highlighted in a What Works Clearinghouse review that examines research on summer counseling for college. The Chronicle of Higher Education cited Lindsay Page in the article "You Can Help Make Sure Freshmen Show Up. Here's How." Page is first mentioned in the 12th paragraph for her collaborative research on "summer melt" with Ben Castleman.